From mowers to muck spreaders, tractors to forage harvesters, there will be a full range of the latest machinery and equipment on show at Grassland UK, including working demonstrations across the 100-acre site. “Having the right equipment and machinery for the tasks at hand can make a huge difference to farm productivity – whether you are looking to boost feed efficiencies with a new mixer wagon or expand a large contracting business,” says head of shows Alan Lyons. Fendt will be displaying its complete range of forage, grassland and hay equipment for the first time ever in the UK at this year’s event. Visitors can expect to see the Fendt Katana forage harvester, which is able to take almost all local conditions in its stride when working on sloping terrain, with soft ground conditions or at high moisture levels. The Fendt Tigo forage wagons and are the latest addition to Fendt’s harvesting equipment. Lightweight, compact and with reassuring stability, these machines have an adjustable bulkhead, meaning the loading area above the pick-up can also be utilised. The Fendt Twister tedders and Fendt Former rakes will also be on display, as well as the Fendt 4180 V Xtra big round baler. New to the John Deere arsenal is the complete range of V400 series variable chamber round balers. 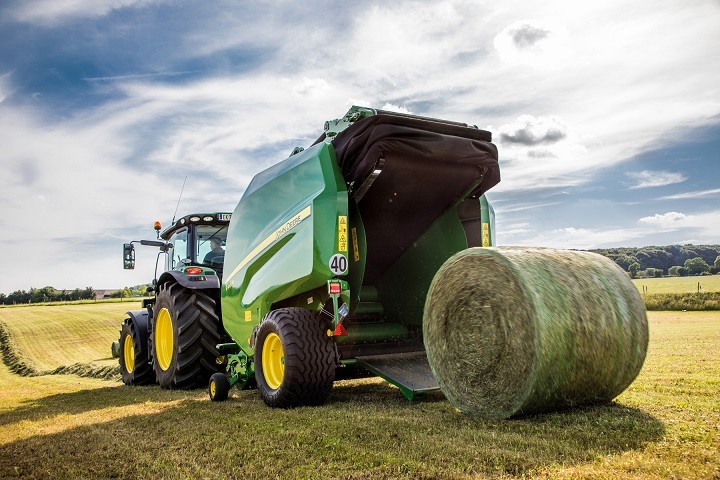 These high capacity balers have been designed to work more efficiently and productively in all crop conditions from wet grass to dry with brittle straw, offering increased versatility and ease of operation. John Deere will also have the new HarvestLab 3000 system for the 8000 series self-propelled forage harvesters on show. Introduced in 2007, HarvestLab was the first NIR (near infra-red) sensing system in the industry to measure silage dry matter and enable automatic adjustments to cut length. The system was subsequently developed to analyse crude protein, starch, NDF, ADF, sugar and other silage constituents, and can now be used for maize, grass and manure sensing. SIP will have a number of machines giving working demonstrations; the first time its machines have been displayed in action since forming a sales organisation last year, says the firm’s Martin Holden. The Air Swath 300F, which is designed to produce top quality silage, free of soil and stones, will make its UK working debut. Mowing will be demonstrated with silver cut disc mower conditioners. All feature hydro pneumatic suspension and are wide spreading for rapid crop wilting. “Cutter-bars come with a shear pin safety system that is replaceable in-field without breaking into the main gear trough,” explains Mr Holden. A range of tedders will also be on display; whether a simple four rotor 4m model, 14 rotor 15m trailed version, or the 10-rotor 11m Spider 1100/10T. McHale will be bringing three new products from its ProGlide Mower Range: The ProGlide F3100 front mower, the R3100 rear mower and the B9000 combination mower. All mowers are fitted with 3m cutter bars with tine conditioners and benefit from novel features which result in better ground following ability and quicker reaction times to changing conditions. “To maximise the feed value of forage it is important that grass crops are cut when the sugar content is highest, and that the mower leaves clean stubble and produces quality forage, free from impurities,” explains James Heanue, Irish sales manager at McHale. The latest addition to the McHale bale wrapper range is the Orbital high-speed round bale wrapper. Using vertical wrapping ring technology, it delivers a high output to keep up with multiple balers. OPICO will feature a number of OPICO cultivators, including the Sward Lifter subsoiler and Sward Slitter for improving aeration, as well as the HE-VA Grass Rejuvenator, designed to over-seed, reseed and establish new leys. It will also be bringing the Strautmann self-propelled SF 2002 diet feeder. Available with a unique contract hire package, it’s a viable proposition for dairy herds of 250 cows upwards. Also on display will be the Strautmann Verti Mix 2401 trailed diet feeder, and the Giga Vitesse 3002 forage wagon. OPICO will also exhibit the Maschio Giraffona 260 rear flail mower and the Bufalo 280 front/ rear flail mower are also set to appear. Attendance at Grassland UK will attract 2 BASIS CPD points for those who register their attendance. The register will be located in the seminars marquee in the trade stand field. Grassland UK 2018takes place on Bridge Farm and Bagborough Farm, adjacent to the Bath & West Showground, Shepton Mallet, Somerset, on Thursday 10 May from 9am to 4pm. Tickets cost £17 (£15 for students) in advance or £20 on the gate. For more information and to book tickets head to www.bathandwest.com.